Hyper Casino takes online gaming to new speeds! Technology has come a long way since online casinos started opening but Hyper Casino is something else. This new age casino runs on an innovative casino platform and it’s all about speed. The website itself loads instantly on any browser (for desktop or mobile). You can browse the games collection quickly and open any game in the blink of an eye. Hyper Casino is an instant-play, no-download casino. Whichever device you’re playing on (smartphone, laptop, desktop or tablet), you’re not required to waste time downloading anything. So long as you have flash player (which comes installed on most devices nowadays), the games will automatically stream directly. Even registering here is a speedy process and only takes around a minute. With an account, you’ll get full access to this new casino and you’ll be able to play games for real money. On top of numerous Novomatic slots, Hyper Casino has legions of other slots, table games and live casino games as well. Hyper Casino is speedy, secure and safe. The MGA and the UKGC license Hyper Casino. They accept players from the UK as well as players from several other countries. Check their T&Cs for full details. Novomatic is one of the most famous casino game developers in the world. From standing slot machines to online table games, live games and slot games, Novomatic has nailed them all. A spate of slot games from Novomatic are available to play at Hyper Casino. Their Novomatic collection is home to handpicked slots and video slots. Top-of-the-line Novomatic games at Hyper Casino include the slots in the Lucky Lady’s Charm series and the slots in the Book of Ra series. The Book of Ra slots are loved mainly for the bonus feature. A lot of slot games from this developer have free spins rounds or bonus features, but this one in particular is very well-liked. To unlock the bonus feature in these games, you need to spin three bonus symbols. The bonus symbol is the golden book of Ra! The bonus feature includes Free Spins that come with a special expanding symbol. The game reveals the special symbol by opening the book of Ra and flicking slowly through the pages. Eventually, the book will land with a page open showing the chosen symbol. Throughout the Free Spins, this specially-selected symbol will gain the power to expand and award extra wins! Mayan Moons, Book of Maya, Pharaoh’s Tomb, Pharaoh’s Ring and Ramses II are some of the ancient-themed ones. This is a very popular slot theme for Novomatic casino games and slots from other game vendors, too. Fruits and other classic-themed slots are also very widely-liked. Fruity, classic slots from Novomatic at Hyper Casino include: Always Hot Deluxe, Hot Chance, Plenty on Twenty, Fruit Drops, Fruitilicious, Sizzling Gems and Sizzling Hot Deluxe. Novomatic games aren’t the only games that feature in Hyper Casino’s game library. At this ultra-fast online casino, you can also play games from myriad other providers. 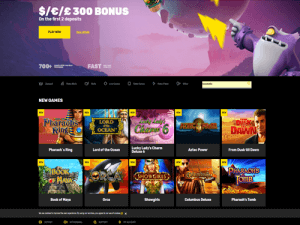 In addition to Novomatic slots, there are slots and video slots from: Amatic, Thunderkick, Big Time Gaming, Elk, Scientific Gaming, MicroGaming, WMS and NetEnt. Immortal Romance, Finn and the Swirly Spin, Book of Aztex, Birds on a Wire and Platooners are top-played slots. There are also table games from NetEnt and live casino games from Evolution Gaming, in addition to other games like video poker and bingo games. Hyper Casino gives a Welcome Bonus to new players who register an account here. What’s more, their regular promotions give loyal players plenty of bonuses, too. As a real money player, you will frequently be able to claim deposit bonuses, cashback and free spins. Loyalty points can also be collected at Hyper Casino and redeemed! Loyalty points are automatically awarded when you make deposits. You can see how many you have by checking the dedicated page when you’re logged in. There’s also a VIP program, filled with VIP perks for top players, which runs on an invite-only basis. This is a secure and reliable casino to game at. It might be speedy but it’s also safe – which is important to confirm about an online casino before you sign up. The website runs with the latest encryption which secures your personal information. The casino is licensed so you know that it operates to the strict regulations of the UKGC and the MGA. Multilingual support is available all day, every day at Hyper Casino, including in English which is great for UK players. Contacting support is a breeze and you can e-mail, use the live-chat or phone.